Whether or not to bring your 4-legged best friend for some on-ice fun can pose some ethical issues. 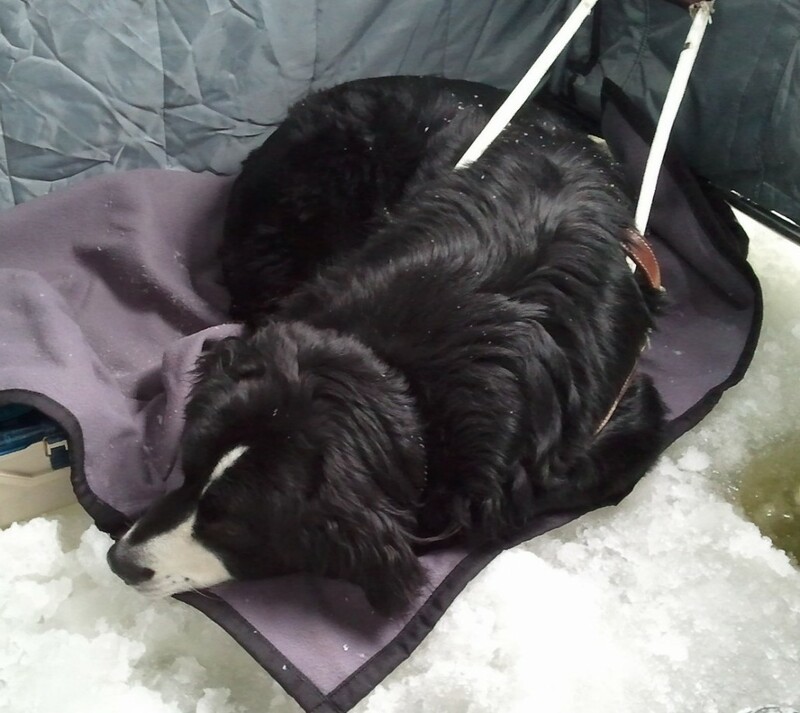 Sure it’s fun to have your dog with you, but will the pup manage the cold? Face facts, for most of us are dogs have grown use to indoor climates and don’t necessarily grow the sorts of heavy winter coats their ancestors once sported. 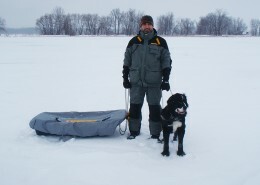 Even for me, I don’t really need to take my guide dog for the blind ice fishing. I never go alone and can get along fine without him. But, he just has so much fun — never mind that he cries like a newborn babe if I leave him behind. So, this is what I do to make sure we all have a good time on the ice. Dogs seem to do better on snow then on clear ice. The snow is an insulator. Glare ice is not. If the conditions are snowy and the wind is low to no, I don’t worry too much, unless the temps are dipping way down there. Then you need to worry about ear tips getting frost bite, or those delicate parts down below that on many dogs are highly exposed. Shelter and some sort of blanket is a must on such days. Keeping dog paws dry is important. 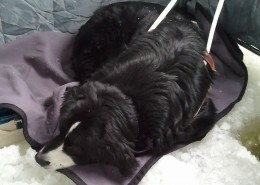 Wet slushy days can quickly turn into ice balls forming between the dogs pads making it impossible to walk. Besides, who would want to walk around with wet feet in the winter. New rubber booties like “Pawz” available at many of the pet stores work wonders, and are relatively inexpensive. 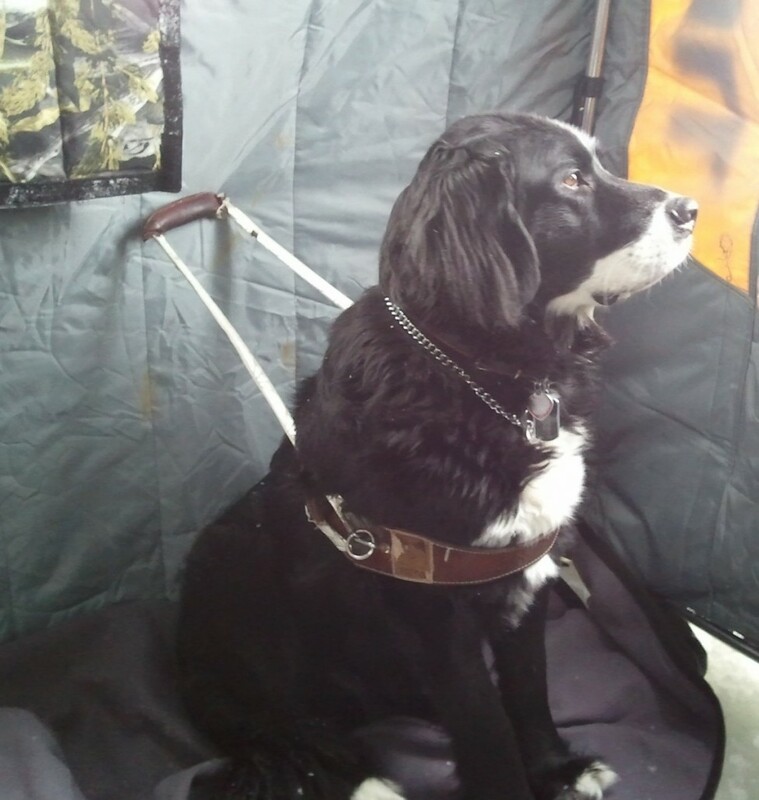 Keep an eye on your pup during the set-up phase of the day. Nothing dogs like more than to mark territory, and for some strange reason this includes the sleds and gear of your buddies. Trust me when I say your pup’s attention to detail is never received with the same pack mentality spirit in which it’s offered. Amazingly enough, some dogs just have the knack of stepping into ice fishing holes. Front entry portable ice shelters are particularly troublesome in this regard as they present twice as many chances for our 4-legged friends to soak a paw. 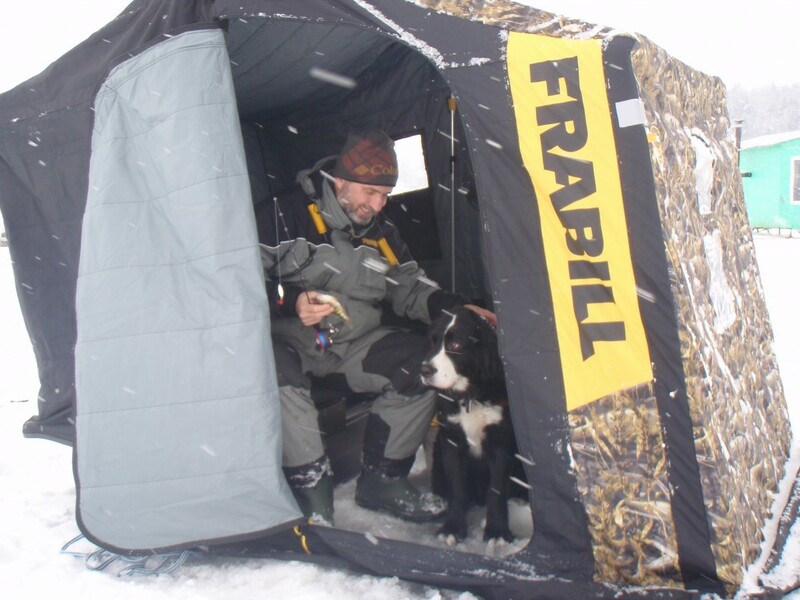 The new side entry shelters from Frabill reduce the odds of paws dunking considerably. Their generous size also offer cozy corners where blankets can be spread and dogs can take a break from the wind and cold. Just try to maintain some separation between the pup’s tail and the heater. Amazingly enough, dogs don’t seem to have the capacity to register the smell of their own fur on fire. Dog’s with solid think coats of fur have an advantage. My pup is a mix between a Lab and a Burnese Mountain Dog, so not only is he fine with water in summer, but he’s got enough coverage on him all-round in winter to withstand the coldest temps. All that fur goes the way of the Dodo Bird every spring when he gets his first shave of the season down to a quarter inch. Have fun, but remember, while these friends will give their lives for us they almost never complain when things are going bad for them. Pay attention, use common sense, and take preventative measures like making space inside the shelter and bringing a blanket. Dogs can hear amazingly well and don’t feel the need to see out, which makes them easy company in shelters even when the windows are blacked out. 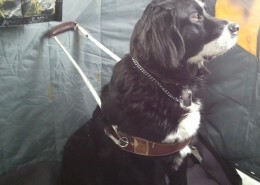 I’ve enjoyed the company of guide dogs for almost 29 years now, and I wish each one would have lasted my life span. It’s up to each of us to treat our dogs with respect as they grow from pups to adults to seniors, and to make sure their relatively short time with us is both enjoyable and safe. That’s also why I feed my pup food prepared by Eukanuba.